This is an port of GLQuake for GPH CAANOO. F 1: Can i play the Shareware Version? A 1: Yes, we can! F 2: Whats is an ".LIT" File? F 3: How to use Change Game? F 4: The Game Crash sometimes? A 4: GLQuake have a lot of Bugs and can Crash. F 5: Can i connect to QuakeWorld Server? A 5: No, you can play only on Quake Server. F 6: I have a custom map how to Start it? A 6: Edit and make an entry in "maplist.txt". F 7: Can i Play the Full Half-Life? F 8: I use 3D Skybox but it dont show me an 3D Sky? A 8: You must make your own Custom 3D Skys. F 9: How can i use Color in Chat? F 10: Quake have few Memory, how i can give more? 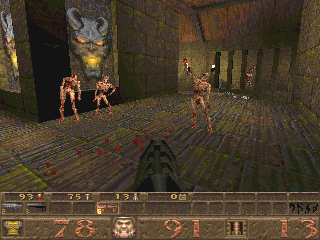 A 10: Read the "id1.gpe" and you will see -mem 64 this will give GPH Quake 64MB Ram. F 11: Bumpmap, how to use? F 12: How can i disable the Dynamic Torchflares? A 12: Easy only set: gl_torchflares 0 thats all. - Add CD Music use .wav as music. In this modified version the frame rate is less smooth, but the light effects are better! this looks and play great but it always crashes in multiplayer! V2 is from me too, lol... Pickle only make the Quake Port. Hmmm. I'm struggling to get this to work. I've placed my pak files in the id folder and installed the .ini files but so far I'm drawing a blank. touchscreen controls don't work correctly. are you going to fix graphics in dm6? i love that map! PLEASE do NOT use a proprietary RAR file format. Use a free software format like .zip. Fully free software GNU/Linux distributions can't unpack rar v3. Read here for more information: https://www.fsf.org/campaigns/priority-projects/index_html/#rarv3 Thank you. Hi Rikku2000, Can I have the source code? I would like to have a look at it. um, 7zip is FOSS and it will handle .RAR files just fine. this is a question for either pickle or rikku2000, how in the world do i make it work?? i used the default ini, nothing. i made my own, still nothing. anything im missing? You need the pak0/1.pak file from orginal quake in ID1 dir. The display freezes after selecting new game, game seems to be going in the background with sounds though.